There’s a good chance the 2014 National Baseball Hall of Fame Silver Commemorative Coins could sell out this week, based on the latest sales figures from the United States Mint. The silver coins would join the $5 gold commemoratives which officially sold out one week ago. Plenty of 50-cent clad coins are available. 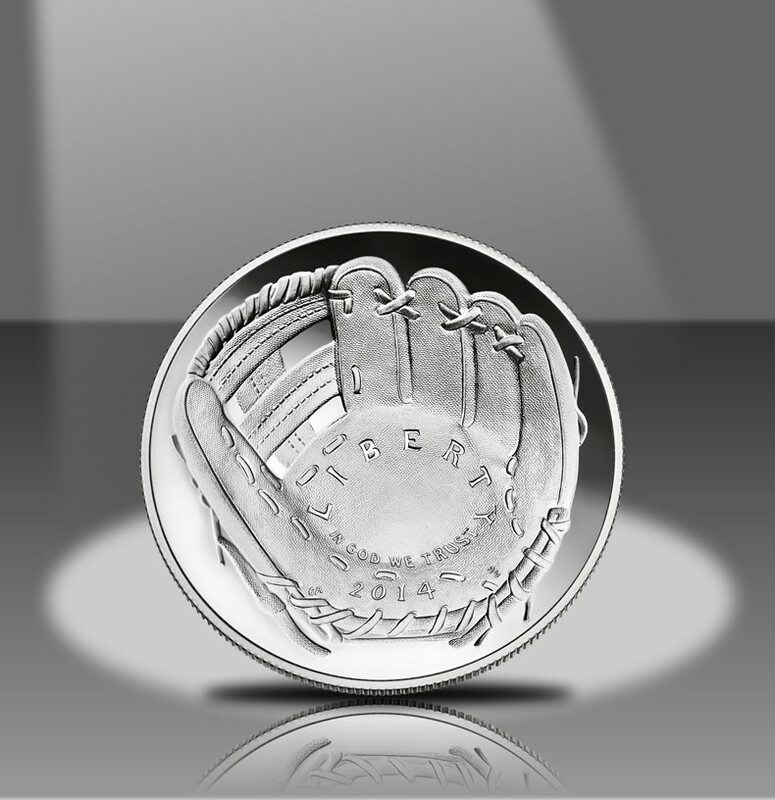 The series of coins launched on March 27 and celebrate the diamond anniversary of the National Baseball Hall of Fame. New sales figures as of 9:30 a.m. today, April 7, have the Baseball Silver Commemorative Coins at 366,340, or 33,600 shy of the maximum 400,000. Demand remains strong with 137,815 more sold since a week ago, suggesting the silver coins could become unavailable very soon. There’s no chance they will not sell out. Sales of the 50-cent clad coins went up 52,621 for a new total of 164,001, leaving 585,999 left from the higher 750,000 mintage. Combining sales for all six coins, 580,341 have sold for a total in dollars of $42,875,983.95. The Act, Public Law 112-152, authorizing the commemoratives requires surcharges of $35 per $5 gold coin, $10 for each silver dollar and $5 per 50-cent piece to be paid to the National Baseball Hall of Fame to help fund its operations. Prices above include those surcharges and total $6,233,405.00 as of 9:00 a.m. ET. To place orders for the National Baseball Hall of Fame Commemorative Coins, visit the United States Mint website, right here, or call 1-800-USA-MINT (872-6468). If you don’t have a Silver one or want to pick up an extra Silver Coin do not wait to do it. Just received one of their “free” bags. They shipped it separately and raped me for $4.95 S&H charges. The POS, isn’t even worth that and I’m appalled that it’s MADE IN VIETNAM! THEY SHOULD BE ASHAMED!! I WANT MY $$$ BACK!!!! The coins are a real collectable,but the surcharges I believe are what might be a donation-which might be tax deductable,and if they are,what if a person does not want to donate to that particuloar organization?. That would put those people out of the opportunity of purchasing a certain commemorative coin. I purchased two sets of these coins and cant wait to get them,thats all I got-PS- the reusable bag was made in the NAM, come on U.S. Mint,no wonder you give them away! I had 2 proofs & 2 uncirculated silver coins. Just picked up 2 more of each. These are going to be special, folks. They will be gone by tomorrow by 5:00 p.m. which is the time the Mint updates the sales for the public to see. Ron, You will not be charged another shipping for the coins. You will only be charged shipping once. Not sure why they sent the bags early, but it costs you nothing extra. Ron lighten up a little. The shipping charges are for your complete order, not just the bag. You won’t be charged again when your coins ship. It is getting a little old seeing people rip the mint for giving you a free bag, regardless of where it is made. On top of that – you had the chance to cancel the bag off your order and didn’t bother doing that either. EVERYTHING that the U.S. Mint makes should say MADE IN AMERICA, Including the bag… It’s an embarrassment to get something from OUR mint here in AMERICA and it should say MADE IN VIETNAM OR WHEREVER. Ron, You’re 100% correct on that point. It’s disgusting. Everyone that orders from the U.S. Mint SHOULD complain about that. With only 90% gold and 90% silver people are paying $1,000 plus for 1 of them. I wouldn’t pay $100 for the gold proof. It’s either .9999 for me or NUTTIN.. Watch out for carbon/copper spots down the road folks.. Store them well. What’s next? Having China minting our coins for us? My order was received at 1:53pm on the first day. The coins came UPS today. They look much better in hand. Good point on storing them Joe #2. I got my silver proof today. And the gold proof is on its way. Mint sent me some proof sets, charged me the shipping. A couple of days later, got some more proof sets, no shipping charge, a couple of more days later, got the rest of the proof sets, charged shipping again. They will do what they want. At least I didn’t have to deal with getting a bag from over there. USN Dec. 67 to Dec. 73. What a bunch of racist comments from some of you people on here about other countries, WOW. In case you haven’t noticed America is not the country it once was, it is no longer the land of the free and the home of the brave, it is the land of the rich and greedy and putting there nose in every one’s business. I served this country for 20 years and it is no longer a place to brag about, I cannot wait to retire and get out of here. Knowing some of you gung ho people out there you will comment and say go now, what are you waiting for, just stop and think about it, if you are at least 50 years old you will know what I’m talking about. I received my “bag” today, my 2014 Proof set and my Proof Clad .50 HOF coin. The proof set is without a doubt, the fines I’ve ever seen. As far as I’m concerned, all 18 coins are flawless. The Proof HOF .50 clad coin also looks flawless and is a beautiful work of art. Hand in there, you will all be pleasantly surprised when yours arrives. I purchased two silver proof coins and was in the virtual waiting room the first day it went up for sale for 2 hours waiting to place my order. I still have not received my two coins yet but the mint shows they are in stock and reserved. I did get the bag a few weeks back. I can’t wait to see these coins in hand.